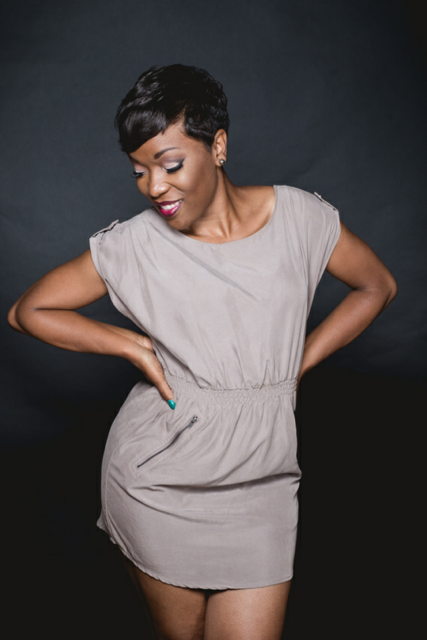 Poet, host, producer, photographer…and just to think, this is only “A Dose of Dupas”! Rebecca Dupas is a multi-talented artist that arrived in the DMV at the age of 6, via the great state of Louisiana. This graduate of Friendly High School (in Prince George’s County, MD), Towson University (undergraduate) & Cappella University (graduate), has taken the Baltimore and DC areas by storm, as a prolific & sought-after poet/spoken word artist and host of numerous open mics. Her openly candid, honest and thought provoking storytelling poetic contents have garnered her with the opportunities to host & feature in events/programs, such as Warm Wednesdays in Baltimore and Busboys and Poets in Hyattsville, MD. 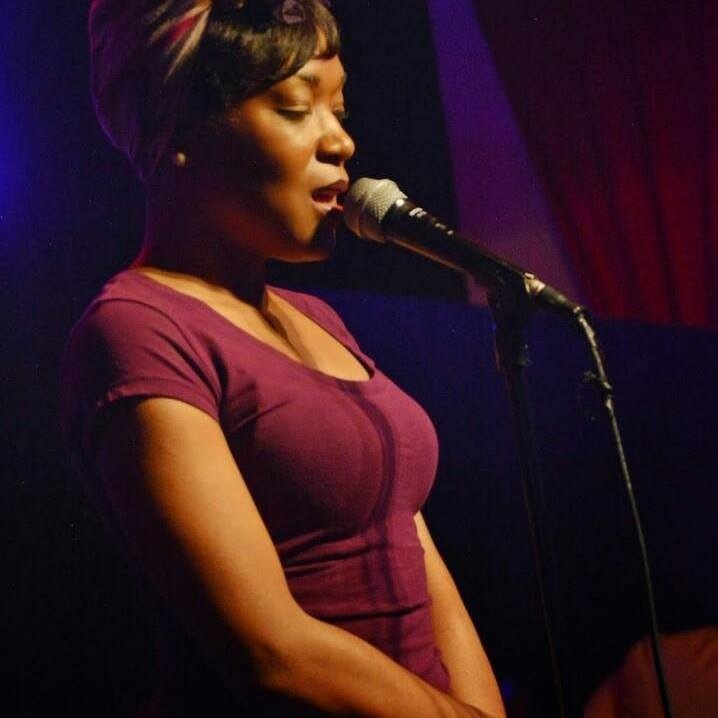 On top of that, her poetic gifts led her to Centric‘s “Lyric Cafe“. Click here to check out some of her captivating pieces. 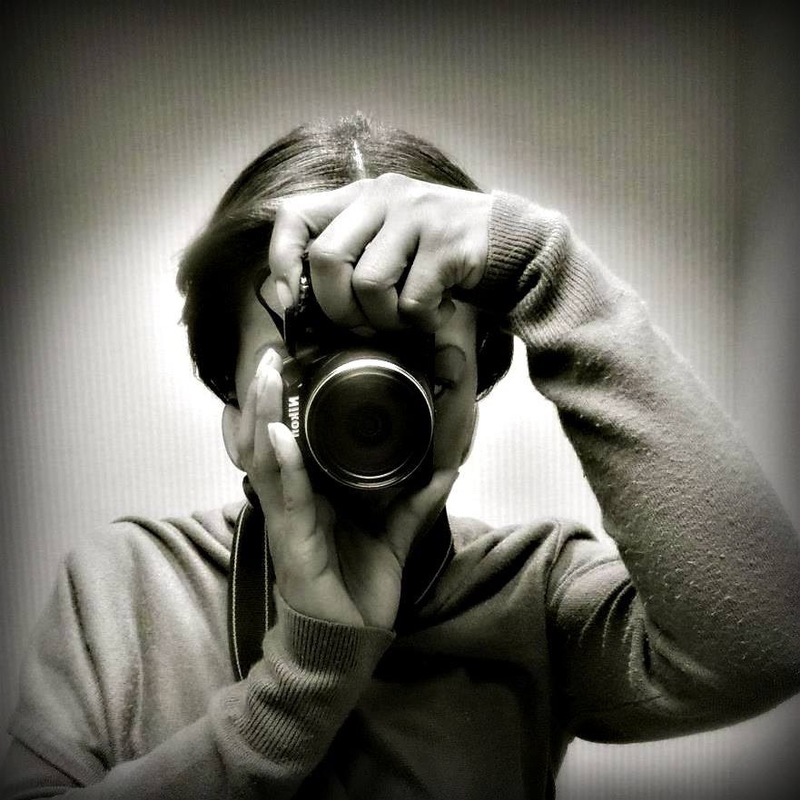 Rebecca’s assortment of gifts have also led her behind the scenes, founding her own production company, “A Dose of Dupas“, as well as the Rebecca Dupas Photography company (also known as B-Sharp Imaging). Stepping behind the scenes has allowed her to influence others in DMV community as well, especially through hosting an annual gathering called “The Baltimore Host Retreat“, which gathers event hosts from the Baltimore and DC areas to trade and learn best practices, while growing and fostering a level of support for each other (and other artists). A: It’s difficult to decide which part of the DMV I represent. It really depends on who you ask. People introduce me in connection to both [Baltimore & DC]. It depends on where they met me, what venue I was hosting at the time, or where I was featuring. I grew up on the Baltimore City art scene with amazing artists like Lamar Hill and Archie the Messenger…artists who, like me, moved to the city and made a home there. I adore it and do a great deal of work there to include writing and hosting workshops. Most of the events I produced or hosted have been in Baltimore city. Still, I have love and respect for the DC scene as well. 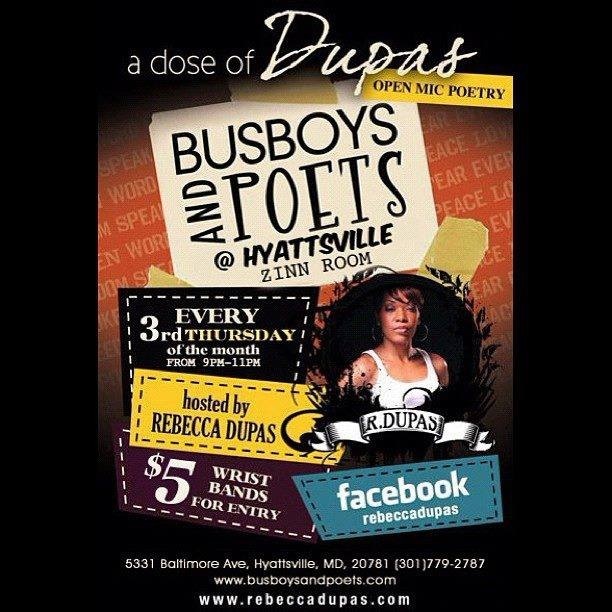 As a host of Busboys & Poets, and as a poet who takes the drive up and down I-95 (like it’s a corner-store run), I’ve worked to be sure that I’m connected to the great things happening in both cities. A: My mother and sister encouraged my poetry writing when I was a young girl in Mansura, Louisiana. They are both writers. Friends in high school and college encouraged me to perform. After my first night at an open mic in Baltimore City, I was hooked! I’ve been performing my poetry since 2000, and writing since my middle school years. Things transpired perfectly. I’m pretty sure that I am supposed to be a poet, host, producer, and author, among other things. I’ve recently established myself as a photographer as well. A: I find inspiration all around me. Those who follow me on social media, let alone are familiar with my work, know that I turn the most random and unassuming moments into either a post or a poem. However, I also take a great deal of subject matter from my personal life. Surprisingly enough, those that I meet still say that I am telling their story. From the business perspective, I continue to produce events because I know that art saves lives, whether we are expressing it or listening to another do so. The same is true for photography; I appreciate the opportunity to help document people and things in my community, as well as capture moments that help others to feel strong and beautiful. Q: What other DMV artist(s) have you enjoyed working with the most? A: My production company houses several live art events. It has afforded me the chance to work with amazing artists and producers. One of my most recent endeavors is the production of a show called “Come On Son“. It is a touring poetry showcase starring myself, LOVE the poet, Shelly Says So & Bria McCormick. It’s always an inspiring experience. I enjoy sharing the stage with these powerful sisters…we always have a great time! Our audiences do too! I also enjoy working with the team at Busboys and Poets. I’ve met amazing hosts in the DMV and poets from all over the country. My favorite photographers to work with and learn from are Tya Anthony, Daryl Taylor and Anthony Tilghman. A: I’m quite the introvert. Most assume because I host and perform that I am a social butterfly. I’m such the opposite. I prefer a quiet corner and a view of the action. My shyness and reservation are often misunderstood. Poetry and photography are tools to continuously pull me out of my shell. I’m grateful for both. A: My fourth CD, Decade Three, drops this year! I’m excited to share this project and hope people will follow my journey at rebeccadupas.com. My photography is taking off and I’m excited to dig into this new(er) venture. People can find our more at bexshotit.com! 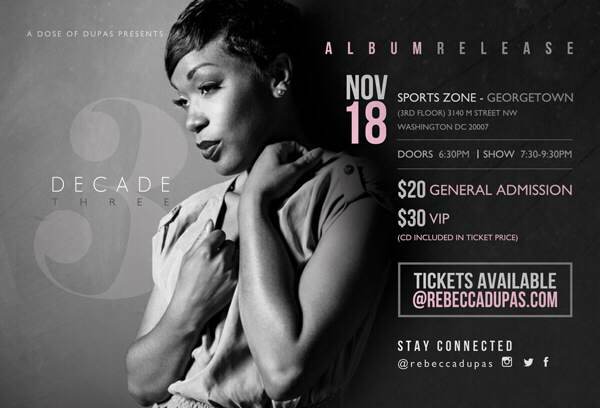 Be there to help Rebecca celebrate the release of her new album on Tue., Nov 18th at the Sports Zone in Gerogetown! You can also find her on your favorite social media networks, including Facebook (Rebecca Dupas II), Instagram (@rebeccadupas & @bexshotit), Twitter (@rebeccadupas & @ADoseofDupas), and YouTube. This star is continuing to rise, and we’re looking forward to more artistic Doses of Dupas to come!